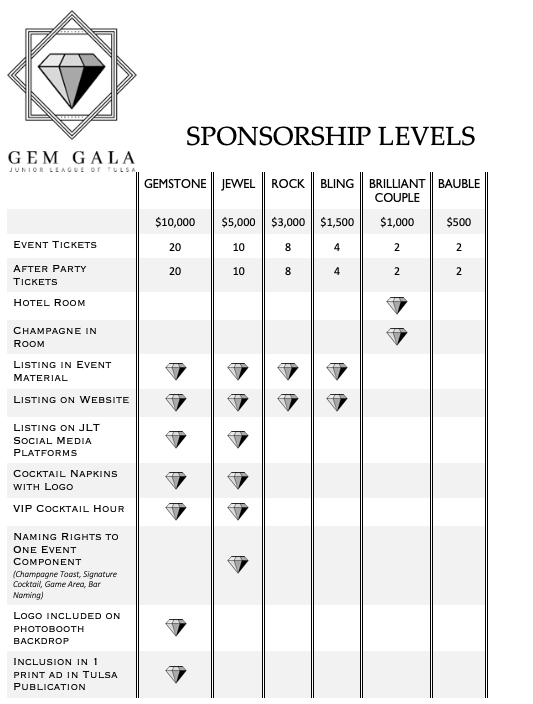 We hope you will consider supporting the Junior League of Tulsa’s work by selecting a sponsorship opportunity. As a GEM Gala sponsor, you are not only helping the Tulsa community by contributing to the Junior League of Tulsa community projects (JLT members volunteered over 40,000 hours in the Tulsa community last year), but you’ll have access to this exclusive event! This year’s GEM Gala will take place on Saturday, April 13th beginning at 6:30 p.m. at the newly restored, historic Tulsa Club Hotel. Become a sponsor today!